The orchestra avoided stodgy reverence in favor of emotional intimacy, which I appreciated. Tempi were nicely varied, with plenty of time given to the score's more introspective moments, and processions and daily routines treated briskly. At the outset of the beautifully shaped overture, the brass seemed slightly shaky, but this was soon resolved, with the French horns, especially, displaying great sweetness of tone. Special mention is deserved by the strings, which echoed, in ways I had not fully realized in listening to recordings, the shaken breath and rapid pulse of the protagonists. I also loved the sensitive treatment of the oboe solo accompanying Florestan's delirious vision of his wife. (The orchestra didn't get an overture before the final scene, which suits the drama, but I never object to an extra Leonore overture.) Both the intimacy of the score and its grand sweep emerged effectively in the pit, even if not always satisfactorily translated to the stage. The chorus was nothing less than excellent, beautifully blended and beautifully clear. The diction of the men's chorus in the justly famous Prisoners' Chorus deserves mention; taken at a deliberate tempo, the hushed "Rettung! Rettung!" emerged with haunting urgency of desire, and the text was beautifully colored throughout. Kang Wang, as the First Prisoner, was notable for a strong, well-rounded tenor. In discussing the principal singers, I should mention that they lost a good deal of their dialogue. I know the dialogue of Fidelio is hardly fixed, but I'm attached to it; also, as I discovered through interval conversations with my companion, who was seeing it cold, cutting swathes of it out risks making the drama less intelligible. I mentally filled in much of what I thought of as the missing bits of the libretto, but less, er, obsessive enthusiasts would have no such option. Even when the meaning was unaltered, I couldn't help feeling that some of the phrases seemed shorn; for instance, that "Ich habe Mut!" lacks some of its felicity if deprived of Kraft or Stärke to complete the phrase. And especially in Act II, I lament the meaning lost as well. If Rocco doesn't say "Jetzt wird er wieder tausend Fragen an mich stellen!" we lose knowledge about his relationship with Florestan. If Leonore, seeing the inmate of the dungeon, says simply "Gott steh' mir bei!" instead of "Gott steh' mir bei, wenn er es ist!" we lose knowledge about Florestan's condition, and it changes what we are told about her feelings. I also like the less frequently included "Meine Leonore, was hast du für mich getan?" Perhaps the dialogue is ruthlessly trimmed on the assumption that most of the audience won't understand it, or won't care; but I missed it. David Portillo, as Jacquino, was not only secure, but unusually pleasing in vocal terms. (I too often find Jacquino vocally as well as dramatically annoying.) I found Portillo's characterization of Jacquino -- insecure, defensive, inclined to violence -- credible, indeed disturbingly so, and well-conveyed through phrasing. Hanna-Elisabeth Müller was an exceptionally fine Marzelline, vocally precise, agile, and sweet-toned. "O wär' ich schon mit dir vereint!" was given with poignant sincerity, and no coyness. I also appreciated that the relationship of her Marzelline with Fidelio was presented as one based on genuine mutual sympathy. As Don Fernando, the minister ex machina, James Morris displayed a remarkable security of tone and beauty of phrasing. His voice is, of course, audibly worn, but I found it rather touching to have a Don Fernando who is not Florestan's peer in age, but rather of an older generation. Greer Grimsley, as the villainous Don Pizarro, was charismatic, but I suspect he was also under the weather. He is obviously a thoughtful singer, but sounded a bit gravelly, and "Ha! welch ein Augenblick" seemed underpowered. Falk Struckmann's unusually jovial Rocco was chilling. His vocally assured performance evoked a bluff, hearty man, disturbingly good at compartmentalizing his sentimental, satisfying domestic existence from his duties as gaoler. "Hat man nicht auch Gold beineben" was livelier in tempo and mood than is customary, to good effect, and I was impressed by his vocal agility (a quality not much called for in other roles I've seen him in.) His weighty bass-baritone had both heft and a smooth presence in the great ensembles, "Mir ist so wunderbar" and "Euch werde Lohn." His is one of the more interesting character arcs of the production, as he discovers that there is something that he will balk at, that there is a task whose price he will not pay, and that he may already have lost intangibles that he thought he didn't need. A first of the evening for me was hearing Klaus Florian Vogt live. I wondered, I confess, about the size of the Met for him; but he was neither strained nor inaudible. I think this is more due to the timbre than the size of his voice; it has a curious, compelling resonance. It's a sound I've found puzzling in recordings, but fascinating on stage. "Gott! welch Dunkel hier!" was, as it should be, an evocation of Florestan's character, as well as of his despair, and his hope. I love this aria--its gorgeous phrases, its text-setting, and, not least, its imagery. (I described the latter to my Fidelio-novice companion as follows: "Even when he can no longer imagine the possibility of earthly freedom, he remembers his wife, and wants her." "Ohhh," said she. Precisely.) Vogt handled both the long musical lines and the text beautifully; credit is due to both him and Weigle, I think, for the dynamic flexibility with which he explored the phrases, as though thought itself has become something that Florestan must force himself to, like the limping exploration of his cell. "Euch werde Lohn" was sung, on Vogt's part, more as a plea for his gaolers to remember their common humanity than as a spontaneous outpouring, a choice I found intriguing and moving. 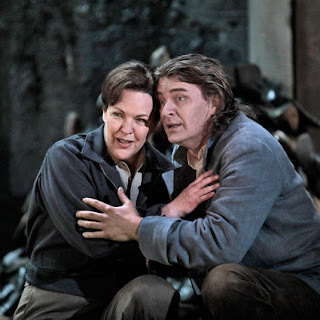 Vogt and Pieczonka, both veterans in their roles, worked beautifully together both dramatically and vocally, and I enjoyed the contrast between their timbres in "O namenlose Freude!" It's no small thing to say that both sounded triumphant, rather than fatigued, in the massive final ensemble. For their sakes, I wish the production had done more with the finale's tension between communal celebration and, for Leonore and Florestan, profoundly intimate relief and shock. Adrianne Pieczonka, in the title role, was stunning; this was, as I myself was surprised to discover, my first time hearing her live, and I can't help an impulse to lament wasted years. This is not, I hasten to add, entirely my fault; a quick browse of the Met database reveals that she's only sung three other roles (Sieglinde, Amelia, and Chrysothemis) at the house in the last decade. Why? I rhetorically exclaim. Her Leonore was resolute, vulnerable, and warm, and I loved her (and her cute Christa-Ludwig-as-Fidelio haircut.) 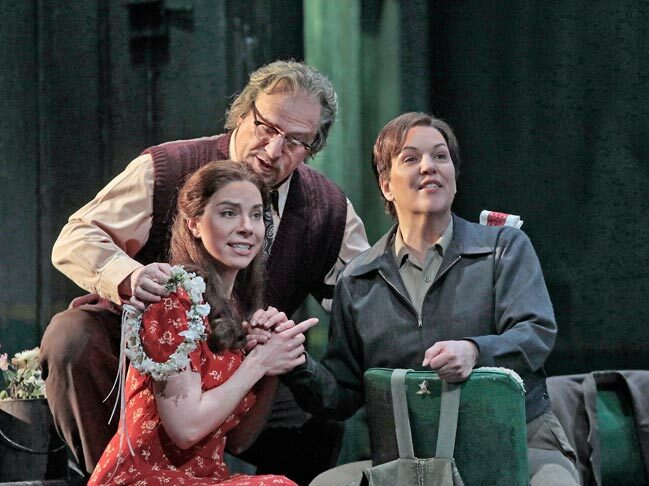 Even with the production's tendency to enforce stand-and-deliver singing, Pieczonka gave a nuanced and dynamic portrayal. In the first act ensembles, particularly "Gut, Söhnchen, gut," I was impressed by her ability to convey both Leonore's internal anguish and her sense of obligation to Rocco and Marzelline. The role's infamous range seemed to hold no terrors for her, as she sang with strength from top to bottom; I appreciated that she could drive home the low notes of Leonore's grim resolve, especially in "Abscheulicher!" Pieczonka united supple phrasing with muscular strength throughout, and used vocal coloring beautifully to convey Leonore's tumultuous emotional journey. I feel very fortunate to have heard her in my first live performance of an opera which is one of my favorites. I think I grinned uncontrollably through most of the finale. A fundamentally Romantic opera, in which the fearlessness of love is celebrated as having radical power to overturn injustice, Fidelio can and should be more than a fairy tale; here, it serves as an expression of hope. I once made a crack about Adrienne, but I must say that in German repertoire she is superb. She was in the Claus Guth production that I saw streamed and was great in this. I was surprised by how impressed I was, to be honest! Maybe German rep is her sweet spot. I'll have to look for the Guth Fidelio.